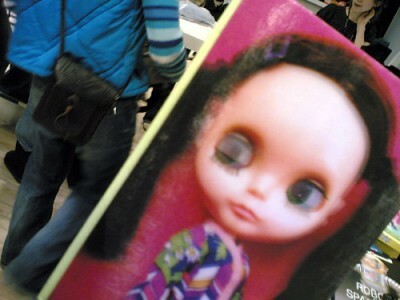 I went shopping with bluemeanie this afternoon and we found this notebook with a picture of a “haunted toy doll” on the cover. Cute it is not. Perhaps it’s a left-over relic from Halloween. Perhaps Topshop are going to branch out into a different market: gothic horror. Over the past few days I have been participating in the traditional return of the sun celebrations, but ironically I haven’t been seeing much daylight because I have been waking up just as it starts to get dark. I also think that my body has been complaining (through the medium of headache) about the reduced caffeine intake so I headed off to the coffee shop in Sevenoaks today to get a large espresso. 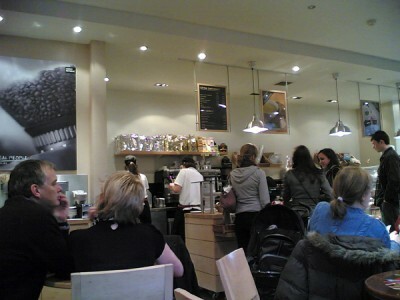 Although the employees in the coffee shop pronounce it expresso they can still make a decent version. Surprisingly I got to the coffee shop while it was still light (I had been out till 2:30 am Saturday morning with Raghav and Sergio). I found that I had to be persistant in interupting the social discussions of the staff in the coffee shop to get them to make the espresso. Later I looked out the window and watched the rain. We have experienced some stormy weather today and last night. I was struck by this graffiti in a parking garage in Tunbridge Wells. 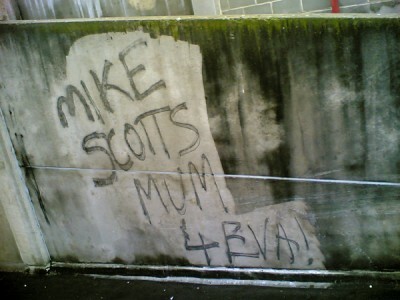 I have no idea who either Mike or Mrs Scott are - but I suspect that this graffiti has nothing to do with either Mike Scott of the Waterboys or Michael Caine and his mother. Caine’s real name is Maurice Joseph Micklewhite but his original stage name was Micheal Scott. walk or cycle down the tow-path all the way to Camden Lock (or back the other way to Birmingham, but that might take some time). The fog has now lifted, apparently for the rest of this year. And so it was Christmas, and it’s all but over now. I had a fairly peaceful time with extended family and friends at Mudkip’s place. I’m also enjoying a break from work as I only return in the new year. 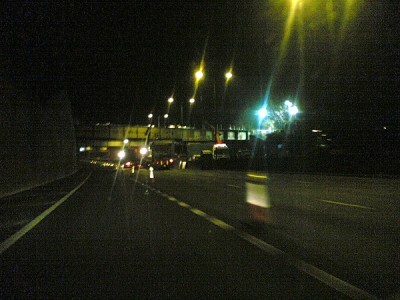 On Christmas night, after all the celebrations were over, I did a trip down the M25 and back (to drop a friend at home). I found this band of workers had shut down all but one lane anti-clockwise between junctions 8 and 7 as they were carrying out some bridge maintenance. After all the complaints one hears (or makes) about the disruptions caused by such maintenance during inconvenient times it is good to see that sometimes such work is scheduled at a time when it is most convenient to the general public (and most inconvenient to the workers carrying it out). 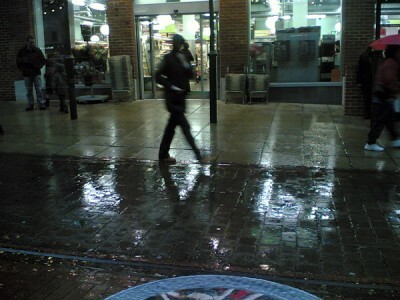 The photo was taken after midnight, so it was already Boxing Day. Personally I would prefer nobody to have to work on Christmas Day (and other key public holidays) but of course we should be remember and be grateful to those who work the emergency and essential services on those days. I took this photograph in Hurst Green the other evening. 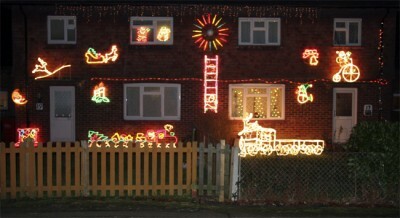 It is a (rare) example of two semi-detached neighbours co-operating with their housebling. Hurst Green is the housebling capital of Oxted. There was a power outage for most of the day today which affected the Limpsfield end of Oxted, Westerham, Brasted and some other surrounding areas. There is no indication that someone’s housebling short-circuited and tripped the power in a local substation. 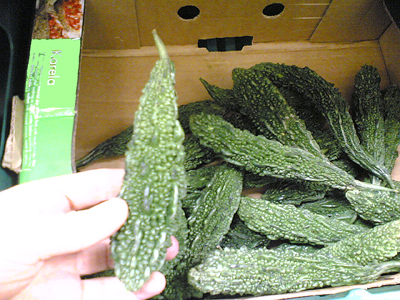 Pinkie and I found this vegetable karela in the supermarket on Friday night. Actually it may be a fruit, but either way it is very bitter and is also known as bitter melon. What struck us was the smell, which was not unpleasant but which strongly resembles the smell of silkworms! There are two days left till Christmas. I’m thinking strongly of starting to get presents. On the other hand Christmas is very commercial and it’s the thought that counts. 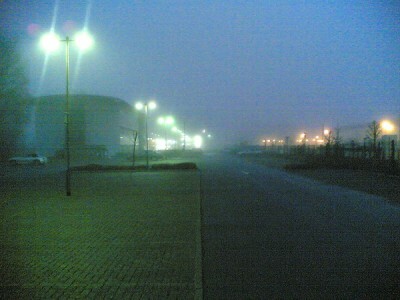 The photograph shows fog (and was taken as I arrived at work yesterday morning). We are currently experiencing an unusual bout of this over Southern England and our planes and cars are grinding to a halt. 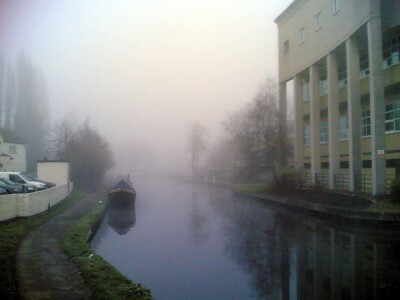 BBC customers have sent in some interesting photos of the fog. Visitors to this site over the past two days would have noticed that they were redirected to a page put up by my Hosting Service, DIY Hosting, advising that the site had been suspended and that they were not responsible for any content which may have previously appeared here. This notice annoyed me because I was actually victim to a Denial of Service attack. I am still trying to work out why they targetted me. Was it something I said? Or was it just part of the general crusade to sell blue pills to middle-aged men, and small chess pieces to younger men? Either way this was a pretty determined person: for example over 53,910 hits were registered in a 3 hour period yesterday morning. From what I can see the attack is still continuing. Nonetheless we must be grateful for small mercies: my hosting service allowed me back into the site, and gave me the ability to bring it up again. I am redirecting the spammers to a static error page. However I still feel vulnerable, and if I disappear again you will know why.